This past week I received the following email from one of my Lake Hub readers. This gentleman and two of his sons enjoy hunting and hunted as guests on a family members lease, but the lease is no longer available. “We sat in blinds that were setup with feeders. We mainly hunted deer, but got a few turkeys; never saw any hogs when we wanted to hunt them. Good questions that many hunters would like answered. Hunting on deer leases are the easy way to hunt, which spoil Texas deer hunters. They come equipped with blinds that can be driven to, feeders filled with corn to draw the deer, and sometimes with lodging for after the hunt. But as you know, they can be expensive. In my experience with leases the price begins around $500 and goes up into the thousands. My best advice if you want to check out leases around your area is go online and see what you can find. There are some public hunting areas that are free to hunt, or they may charge a small fee to enter the area. Examples are National Forests or other National designated wilderness areas. 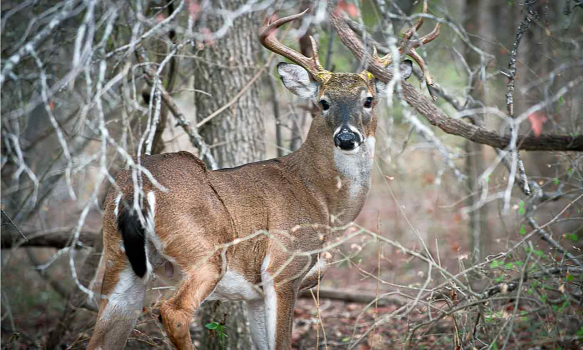 There are also some Texas State Parks that offer hunting, but usually you apply before the season opens with TPWD. They have only so many permits per park. The lucky hunters are drawn out the accumulated entries. Check the TPWD website (hunting) for more information on this opportunity. The National Forests are probably the best bet. Check the National Forest website for locations within your travel boundaries. Call the provided phone numbers for additional information. In East Texas, some of the logging companies open their land up at certain times for hunting. Check online for East Texas logging companies. At any of these locations it will be what Texas deer hunters call primitive hunting ... no feeders and no stands. I personally like this kind of hunting. I like the challenge of walking in, finding tracks along an established trail and staying there for about one to two hours listening for sounds of a deer approaching. I want to keep the wind blowing to me, not at my back. Keep clear shooting lanes. One time while hunting in Oklahoma along a logging road I had a doe come down the road, pause, check me out (I was perfectly still) and proceed down the road. It was one of the highlights of that trip. At another time while hunting whitetail in New York, I had a small herd of deer come running along a ridge toward me. Unfortunately, they were all does; only bucks could be harvested.